A new free pattern - a palm-sized thread-jointed bunny rabbit! Great for Spring or Easter decorations, or you can make a bunch and act out your own version of Watership Down. You can download this and print it out (8.5 x 11 or A4 sized paper, 150 dpi), all the instructions are included right on the pattern so it's easy to hand out for a sewing class or crafty get-together. The full sized pattern makse a bunny about 6.5 inches / 16.5 cms tall (standing). If you enlarge it, it's better to use plastic teddy bear joints as they're sturdier than thread jointing. You'll have to get a bigger sized eye as well. For the example bunny, I used a chenille fleece, you can also use regular polar fleece, minky, robe velour, velveteen, velboa or short pile faux fur - basically anything slightly stretchy with a fuzzy surface. To make it easier to work with, you can iron on lightweight fusible interfacing to the wrong (inner) side of the fabric. If you're making the bunny as decoration, you can individualize it with accessories - embroider a mouth and nose (I did, but it's hard to see because I choose a too-light floss color), whiskers, paw pads or claws, and add ribbons, buttons, felt doo-dads and so on. IF YOU'RE MAKING THE BUNNY FOR A SMALL CHILD there are some safety issues to take into consideration. Instead of thread jointing, either use plastic teddy bear joints or sew the arms and legs to the body with a ladder stitch. Thread joints are too fragile for a child to play with. 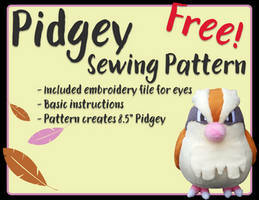 You can use safety eyes, or you can sew on a felt eye or embroider it. Instead of a pom-pom, sew a gathered circle of fuzzy white fabric for a tail (I did this in the example bunny). Skip the added details mentioned above. I wish I could figure out how to design my own pattern! Did you mix up the parts where it says 'Cut 2, 4 mirrored'? I meant where it said 'Cut 4, 2 mirrored'. Sorry. Ah...Nevermind. Apparently wasn't paying attention all that well.